The front entrance of the Mitchell Wing of the State Library of New South Wales, the oldest library in Australia, is located along Shakespeare Place, off Macquarie Street. 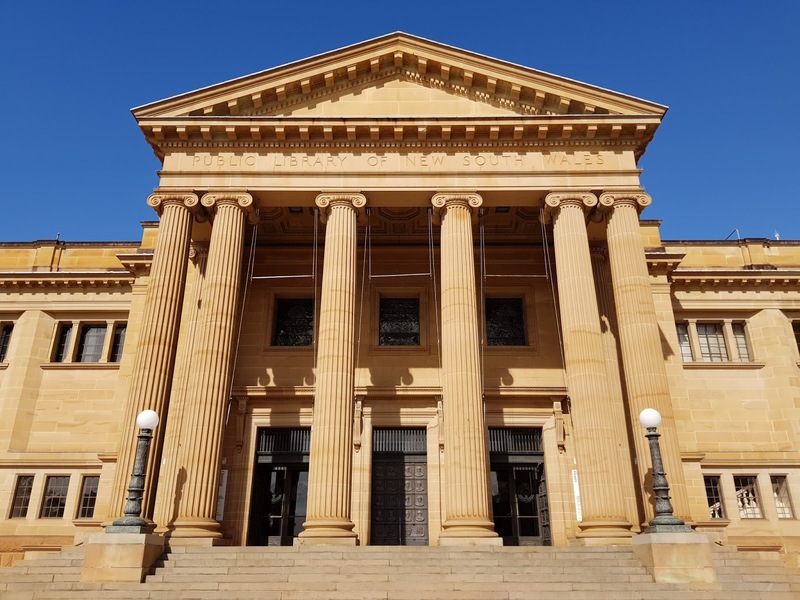 The Mitchell Wing was completed in 1910 and built to house the collection of Australiana donated by book collector David Scott Mitchell to the people of New South Wales. The facade of this heritage listed building is designed in the Neo Classical architectural style. Linked to: Shadow Shot Sunday, Sundays In My City. The front entrance of the Mitchell Wing of the State Library of NSW is amazing, and the interior space is even more amazing! Only managed a drive by photo of this building! Would have loved to visit it. Quite grand! There are more than a few buildings in this style in Washington, DC. Linda, are any of them built in sandstone? It looks like a very impressive building. How stately! There's something about interesting architecture that makes me stop and look twice. I don't think Canada has preserved as many historic buildings as Australia has...wonderful treasures of the past! Thanks for sharing. A fantastic building and a wonderful part of our history and heritage, Jim. Thanks for joining us at the Travel Tuesday meme.